What do I do training wise, taper wise now? Will I risk injury by training more? Have I lost some fitness on holidays? Have I raced too much this year already? Am I perfectly ready for it? These are the questions to be answered carrying on from my post the other day. The key with any race, but particularly one you have had to qualify for and be lucky enough to be successful in a draw for, is to make the start line in one piece. I could try putting pressure on my training for a few days, as it is still 10 days away but I have decided to try and be a bit smarter. I ran on Sunday with an hour of hill repeats,(mainly to practice with my poles. I was lucky I did as one of the poles was stiff and needs attention). On Monday we went for a little kayak on the River Avon, yesterday I did a bike and core session and today I will go for a short run in the evening. This still leaves me 10 days short of race day. My general plan is to keep things as normal as possible, eating properly, training daily (but a lot less than normal) and from Sunday on, race prep and more rest. Of course at this stage I won’t get any fitter or stronger but the key is to stay loose and feel strong. I feel that since Snowdonia in mid July I have trained very carefully and am more rested than I was prior to that race. At least that should be the case, fingers crossed. So what are my goals for next week? As discussed the number one goal is to stand on the line, two is to enjoy the race and three is to finish. On top of this I would like to push myself for the top 100 and I will only really know mid race if I will be capable of this or better. I am not putting big pressure on myself. After all there is over 6000 metres of ascent and only once in my life have I ran further than 100km. Sure it is only 2 and a half marathons in the Alps! This said I am gaining experience in every race and feel mentally ready for this one. There will be major up and down periods in the race but as I always say, if you focus on the good times, you will battle through the bad, knowing there are more good ones to come. Might sound a bit on the silly side but in ultramarathon running positivity can be the difference. I don’t really intend to set split times along the course. This might put too much pressure on and I would rather pace myself according to feel. The one thing I intend to do is start with a good climb in the first 5km and get a reasonably nice position early on. I have been informed that if you go out very slowly the bottlenecks on the narrow trails will increase and this can cause you to slacken off your own pace. I have also experienced getting considerably cold in these situations in the past. The most exciting part of this event is the fact that this will be my first ever race in the Alps, not to mention a pretty prestigious one at that. 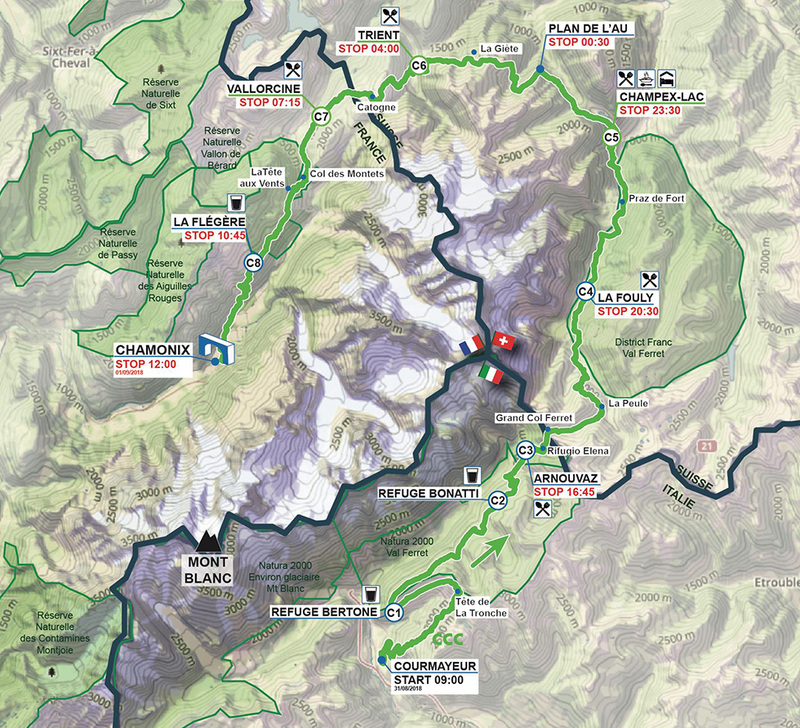 I will see lots of the pro runners and will have the opportunity to follow all the races, including supporting Shaun Stewart on his TDS 120km race on Wednesday and watching the UTMB 170km race on Saturday, the day after the CCC. To make matters even more exciting Emma will be there as well as Sinead and Kieron (my well known running buddies) and a chance of my folks showing up in their campervan too I’ve heard. I must race in amazing places in Europe more often! So I hope to check in here again later in the week or early next week for a final pre race post. In the meantime it is back to the Bristol job hunt and time to start gathering race kit from all corners of the house. It is the 19th of December and at this stage, as far as racing is concerned it looks like most of 2018 will surround my luck in the draw for CCC on the 11th of January. Fingers and toes crossed. In the mean time it was time to enjoy some training and work hard as winter kicks into gear. I actually really enjoy getting a good run at training at this time of year. I think back to this time last year when I was resting up with hip issues and wondering when my training would start for The Race in March! It turned out to be quite the 2017 event wise. It just comes to show what you can achieve in a year, even if the one before wasn’t the success you had wished for. I hope to do a 2017 summary post over the Christmas and finish the year with a lash at a PB in the 10km in Athenry on the 26th as well as a duathlon on the 28th of December. Mountain Biking in the Burren. My weekday training has been high intensity but boring in terms of writing here. Basically working a bit on speed and keeping strong through the winter. It has been a busy year and the legs don’t need crazy distance. The cross trainer is turning out to be a good mate, less impact on dodgy toes and great for full arm and leg workouts. The gym is a great tool all year, particularly in the winter but there is little substitute for the outdoors. I spent two weekends ago in the Burren trashing out some hilly mountain bike trails and then last Sunday I ran up and down Croagh Patrick twice. It is hard to beat the hills. I definately lacked hill training before the Mourne Marathon and paid the price. We all learn from our mistakes and I hope not to make that particular one again. As for training with friends in the hills or wherever your playground is, I couldn’t recommend it highly enough. It will clear the head and you make good friends along the way. This time of year is busy for everyone and a costly time too. The best advice I can give is keep up some short high intensity type training during the break. This of course is if you plan on keeping fitness over the break or just having a total rest period. It is different for everyone and important to do what the body feels up to. I had a little money saved during 2017 towards races in 2018. In the last few weeks the plans have started to come together and it looks like I have a long list of events already building up. I won’t get into the details but it looks like a start with the Donadea 50km on the 10th of February, followed by a return to multi sport racing with Gaelforce Dublin the following weekend. I plan on entering a few of the duathlon national series races to work on some speed coming into Gaelforce Dublin, depending on free time to enter. This is my motivation for the winter and I would advise getting a race or two on that calender early, if you feel you need to motivate on these dark evenings. A little trot and a wander across the Galtee Mountain range is in store for next weekend. We might as well make the most of the 8 hours of light we have. I hope I can get a few photos along the way and make up for the grey misty Croagh Patrick last weekend! Goofy on top of Croagh Patrick on Sunday! Most of my mountain biking session was on the road on Monday with little time to make it out to the hills or offroad. I hope to do this a bit more over the next few weekends and even get a night session or two in soon. I am slowly building up my distance on the bike and kayak, with the hope I will be back running next week. This has been my longest period out of running in years, but I am sure I will have built up a new hunger when I return. Mountain biking on Monday evening. The first sign of sunshine in months! Check out info on our team IKAT and upcoming events here. I will post in some detail as to our training ideas and my own thoughts on this new adventure really soon. For now I am still trying to get my head around the madness that is to come. I spoke last week about fear and how we experience the fear of failure. Fear of injury is another experience all athletes have. So, the question is, is it all in our heads? Well to be honest this is not in my head, it is in my right leg and it doesn’t feel like fear! I have been training well the last two weeks but running has been awful. I managed to play some football but prolonged running is causing something at the back of my knee to flare up, stopping me completely in my tracks. It may be some tendonitis, an overused muscle or many more things. I will have physio again tomorrow to figure out the issue. I trained at a good intensity, staying away from running all week and after 2.5km of slow running yesterday it flared up again. Anyone have any ideas or experience this before? I am probably in need of a rest. I haven’t been killing myself training but there comes a time when the body says slow down and I feel this is mine. A few days doing very little is probably the best tonic. I have experienced lots of injuries, especially while playing football over the years, so this is nothing major to worry about. I also think that every injury tellsus more about how we work, how to treat an injury and it will also pinpoint weaknesses that may need extra attention. Here is a shot out on the bog yesterday, in the middle of a snow shower. It was a nice morning on the bog with the dogs. It was also most likely a factor in causing my leg to flare up again, as the ground was extra soft. This is a typical West of Ireland, January shot though. We might see the sun again soon, you never know ! The answer to my question above lies in the training calender, I may need to rest up more !! Well this really is a question we could spend an eternity on. Everyone is talking about nutrition these days. I have always had a decent diet but I did, for the most part, make a big effort in the last year and a half. It has paid off in my times and progress but how much really is this due to diet? The honest answer is I really can’t prove one way or the other. What I can say, however, is that my recovery time is way down and my energy levels are good. So what have I changed in the last year that is working ? My diet is now roughly 60% vegetarian, 30% fish and 10% meat. To many this seems crazy for someone training 6 times and 10 hours a week but why not? I get all the nutrients and energy from the veg and fish and probably a lot more than I previously got eating more meat. Next up is the additions and subtractions to my old ways! I have stopped eating pasta, potatoes, chicken, red meat (small portions and odd steak every now and then) and replaced these with more fish, halloumi cheese, quinoa, buckwheat and lentils. Instead of just porridge I add two eggs, chia seeds, sesame seeds, peanut butter and honey. Instead of eating bread/ sandwiches I eat rivita, crackers, cheese and have leftover dinners and avocado for lunch. I will be honest I still love bread but now I eat seeded and brown and rarely white. I love chocolate but now I eat dark chocolate in orange or sea salt flavours. These are only a few examples of changes but they actually are tastier. I enjoy my food more now and the processed foods are becoming a thing of the past. Nutrition is not my area of expertise but I have learnt from others and I really believe anyone can improve their health and fitness by tweaking even one or two meals a day. January, the mixed up month ! It really is a strange month. A month of weather, mostly bad, not to mention the real Irish winter. That being said I have found it a good month to build up a little more, and I reckon even improve on fitness. It has been a seriously mixed bag of training though. Football, running the streets, trail and hills, cycling in the gym, cycling on the turbo trainer and a little strength work thrown in there somewhere. So as you can see there has been very little planning to my sessions. I think this can sometimes be a good thing as training plans can get very boring after long periods plodding your way through them. This is an idea of the last week in my training schedule. I have plans to enter a few mountain races in late February, March and April. These all involve weekends away but hopefully it will all stand to me when the adventure racing season starts up again. My longer bike sessions of late seem to be going well and a few long spins over the next month will be very beneficial. I will dust down the GoPro camera and start blogging more as the season kicks into gear. I spotted the daffodils poking their heads up today and the evenings are noticably longer so that gloomy season is almost behind us. Those of you that have stuck to the January training schedule, now is the time to up your game and hit things even harder as the fun season approaches! As my blogging would have been a little on the boring side, I decided to hold back on the blog a little of late. Training has been good apart but I have been confined to alot of indoor training and lets be honest it really isn’t that exciting. I really believe we can all benefit from training indoors and if that weather really is crazy, don’t just skip training because of it ! This is the current weather in my part of the world. Ireland is under that rain somewhere and Hurricane Rachel is just off our shores, Storm force 11 and 12 winds forecast with gust up to 150km/hr possible. Thankfully tonight is my rest night. I had a good hour long physio session after training last night so the rest is welcomed anyhow! The last weeks training is summarised in the link below. The Garmin site has been acting up and my watch is not downloading properly, but it gives an idea of latest efforts.